What I am going to do today is something quite a bit different. I went back to my roots of writing stories about pictures, but I threw in a few twists. First, you write 100 words AND ONLY 100 words. Secondly, whatever your mini-mini story is about, the last word has to end on an absolute BANG! Below is a painting called La Tentation de Sainte Antoine, which may or may not mean The Temptation of Saint Antoine. (I like the possibility that it could mean something completely different, possibly related to a beverage of some kind.) 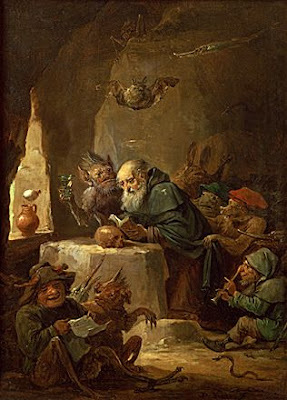 The painting is by David Teniers the Younger (in case you were likely to confuse him with David Teniers the Elder, or David Teniers the sea-lion). If you would like to try it too, leave your 100 words in the comments, remember to end like you mean it, and good luck!